When we think of wine, there are a few countries that instantly come to mind. France is surely one of those countries; as one of the world's largest wine producers, the country produces between seven and eight billion bottles of wine per year. 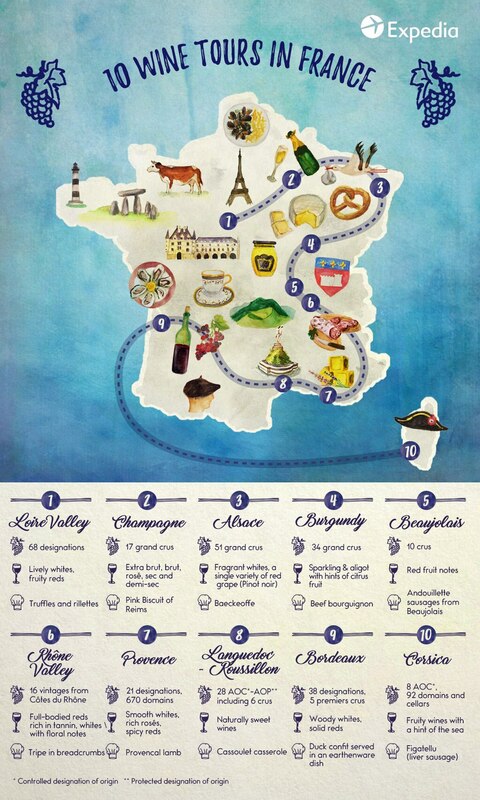 So if you're looking for an amazing wine tour, France should definitely be your destination. From Provence to Bordeaux, here are our favourite spots for the best wine tours in France. Welcome to the largest vineyards in France, covering the country of Nantes, Anjou, Touraine, and the Centre. Visiting the Loire Valley is the perfect opportunity to sip wine while checking out the local castles! The temperate climate means plenty of muscadet and chinon. Rabelais was fond of it. Long live the bubbles! Only the pinot noir, chardonnay and pinot meunier grape varieties - all of which love the limestone soil found here - deserve to receive this royal appellation. From the massif of Saint-Thierry to the mountain of Reims, hundreds of vineyards are just waiting to be explored! The Sylvaner, the Riesling and the Gewürztraminer are all found here, showcasing the soil diversity of the region. From the Haut-Rhin to the Bas-Rhin, explore the flowered villages, medieval towns, and more than 170 km of vineyards. If you were to choose only one route in Burgundy, opt for the prestigious Route des Grands Crus which leads you from Dijon to Santenay. Let yourself be tempted by the green gold of a Chablis or by the voluptuousness of a Pommard. Make sure to stop at the Château de Clos de Vougeot for a small wine tasting of the region. It is in large part to the gamay grape that one owes the Beaujolais. From Saint-Amour to Lyon, 140 km of vineyards spread out over a multitude of different soils. Cross the mountains, visit the small churches, and do not miss the so-called "Land of the Golden Stones"! From Avignon to Vienne, the Rhône Valley serves as the perfect hub for wine tours; these vineyards are primed for exploring lavender fields and rolling hills. Along the way, taste the power of a Châteauneuf or a Saint-Péray, both famous in this region. From the Alpilles to the Esterel massif, the Provençal vineyards often focus on rosés. The three dominant appellations are those of Coteaux d'Aix-en-Provence, Côtes de Provence, and Coteaux Varois. Wanting to head to the sea? Head southwest of the Massif des Maures to enjoy the beautiful vineyards of the Côtes de Provence! If you're hunting for good wines, taste a Faugères or a Saint-Chinian while in the shadow of the imposing Black Mountain. Do you prefer the sea air? The vineyards of Banyuls offer exceptional natural sweet wines in a dazzling setting between the Mediterranean and the Pyrenees. Behind the umbrella name "Bordeaux wines" are some of the most prestigious appellations in the world, such as Pommerol or Saint-Emilion. Among the possibly itineraries, choose the route of the castles in the Medoc region. Cycling paths and trails lead you to the Château Margaux, the flagship site of the vineyard. With its many microclimates and soils, the Corsican region showcases a variety of tastes along its coastline. To find the route of the wines, nothing is simpler: you just have to follow the coast. To the north, taste the Muscat of Cape Corsica and, to the south, the wines of Figari. The wine tastes that much better with such a gorgeous surrounding!